Dr. Andy has a special interest in the placement and restoration of dental implants. In fact, during his residency, implantology was a primary focus of his. He’s also taken hundreds of continuing education hours on this area of dentistry. Dental implants are a permanent and appealing solution to replace missing or extracted teeth. They are superior than other alternatives to tooth replacement, like bridges or partial dentures. Dental implants are essentially root “replacements” that allow Dr. Swiatowicz to place crowns, bridges, or dentures securely on top of. The entire implant process is performed over the course of a few months. 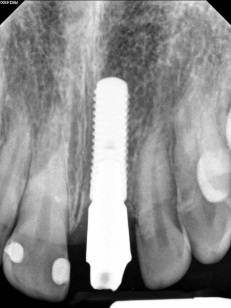 The first part of the process is to install the implant itself, where a titanium screw is placed into the jaw bone. The implant must be allowed about 3-6 months to heal, and during this time the jaw bone will form around the implant in a process called osseointegration. During this healing time, if appropriate for your case, you can have temporary crowns installed so that you can eat and speak normally and maintain a nice smile. Once healing is complete, Dr. Swiatowicz will create the restoration to go on top of your implants. This could be a simple crown, a bridge, or even a full set of teeth. Your smile will look just like it used to, and the implant will feel just like one of your own teeth! If you would like to learn more about dental implants, schedule a complimentary consultation with Dr. Swiatowicz. He will be happy to answer all of your questions and discuss the best treatment options for you.